The Fertility Awareness for Community Transformation (FACT) Project fosters an environment where women and men can take actions to protect their reproductive health throughout the life-course by testing strategies to increase fertility awareness and expand access to fertility awareness-based methods (FAM) at the community level. 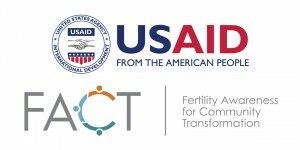 Increased fertility awareness improves family planning use. Expanding access to FAM increases uptake of family planning and reduces unintended pregnancies. The FACT team employs a systematic approach to testing these hypotheses through developing and investigating innovative solutions to improve fertility awareness and expand availability of FAM. The approach is guided by the Solution Development Cycle, an iterative process for the discovery, design, and development of solutions using formative research, participatory design, and intervention testing. The aim of this process is to translate scientific data into simple, practical, and scalable solutions which can be integrated into existing platforms both within and beyond the health system such as community-based nutrition groups, agriculture co-ops, savings and loans clubs, and pregnant women’s groups. To test the hypotheses, FACT develops and evaluates solutions for feasibility, acceptability, and effectiveness. Each of these solutions is described in more detail below. Wondering what games have to do with reproductive health conversations in Nepal? Everything! Pragati is a package of nine interactive games developed and refined through robust proof of concept and pilot testings in Nepal. Through game-play and critical reflection questions, they sparked challenging conversations in communities around fertility and family planning, side-effects of family planning methods, and social norms that drive birth timing and family size. As a research intervention, preliminary results indicate that the Pragati games effectively increased fertility awareness and established an enabling environment for family planning use. The Roving Auxiliary Nurse Midwife (RANM) intervention is a community-based intervention piloted in Nepal to facilitate access to reproductive health services by marginalized communities. RANMs provide direct family planning services at the household level in marginalized communities to improve maternal and child health outcomes. Through a combination of home visits, community activities, and mobilization of influential people and community members to expand conversations around social norms and reproductive health, the RANM intervention was successful in reaching marginalized households and linking community members to the formal health system. Everyone enjoys a show! But do they learn from it? EDEAN was piloted as a six month peer learning and community theatre intervention to diffuse fertility awareness and family planning information among socially marginalized Karimojong communities. EDEAN was designed as a community group engagement approach that included gender-synchronized peer group meetings, and theatre performances directed toward young men and women on: 1. Couple communication; 2. Menstruation; 3. Fertility, and; 4. Family Planning. The performance dialogues centered on deconstructing norms and beliefs around fertility awareness and family planning and diffusing this accurate knowledge throughout their community. The intervention effectively increased fertility awareness and demand for family planning in the region. Serial radio dramas don’t just entertain … they change lives! Through the tangled love lives of its characters, Impano n’Impamba (A Gift for Today That Will Last a Long Time) addressed complex issues like family planning, gender-based violence, and maternal and child health. The radio program was created by FACT Project partner, Population Media Center (PMC). Listeners in Rwanda tuned in for the 104-episode drama which aired twice a week on national radio stations. Impano n’Impamba integrated information about the menstrual cycle, when/ how pregnancy occurs, who’s fertile and when, into story lines. Epilogues were used to highlight essential fertility information and motivate listeners to utilize health services. Results indicated that the serial radio drama improved fertility awareness and created a more supportive environment for family planning. An emerging body of evidence shows that group learning — a community-based approach outside the health system — can be effective in delivering vital health information and encouraging behavior change. WALAN is a community-based group learning approach. Young facilitators, selected by their peers, work in male/female pairs to lead community learning on fertility awareness and FP and offer counseling in two simple fertility awareness methods: Standard Days Method (SDM) and TwoDay Method. Findings suggest the group couples counseling approach is acceptable and effective in teaching couples how to use FAM correctly. Fertility apps have enormous potential to address unmet need for family planning. To provide accurate information to women and couples, as well as to their health-care providers, it is critical that fertility apps be studied according to standard procedures for contraceptive efficacy studies. IRH conducted a prospective, real-world efficacy study of Dynamic Optimal Timing™, or Dot™, to determine the app’s perfect- and typical-use efficacy and to understand how users act on the information they receive from Dot in order to avoid pregnancy. In an effort to diversify the method mix in Nepal, the FACT Project designed and supported the introduction of the Standard Days Method (SDM), in collaboration with the Family Health Division (FHD) of the Ministry of Health and Population of Nepal and the National Health Training Center. The experience provides a model for further expansion of the method. The Ministry of Health and Population of Nepal and USAID tested a social marketing strategy for introducing SDM in the urban areas of Banke and rural areas of Bardiya through the Nepal Contraceptive Retail Sales (CRS) Company. With technical assistance from the Institute for Reproductive Health, CRS tested a multi-level approach for the social marketing of CycleBeads. This experience furthered our understanding of the importance of supportive supervision, timely availability of products, and the involvement of men in family planning.